Many people ask why their cat eats plants. My vet told me that in his opinion it’s an instinct that kicks in where the feline automatically starts adding roughage to their diet to aid in digestion. Note that some animal experts disagree with this. They tend to agree with the digestion issue, but believe the pet does this to help them expel things from the stomach like the dreaded hairball. Either way the major problem is, not all plants are safe and sometimes indoor cats will chomp on a beloved houseplant that you don’t want damaged. My boy Thomas was guilty of this until we found something green he liked much better. Some pet owners operate under the misconstrued notion that if you own a cat you might as well give up on raising any houseplants. There are in fact quite a few plants that are poisonous and dangerous to cats and dogs alike. There are also plenty of safe choices. Think about using cat grass to fill the green void in your cats diet. Cat grass is specially designed for the feline digestive track and seems quite tasty to my cats. But you also want to establish an area where your pet knows its okay to eat plants. Preferably by the usual and approved eating area. This would be a good place to deploy your cat grass or similar products. Here are some pointers on finding the right plants and creating a safe environment for you, your cat and the houseplant. A rule of thumb when growing houseplants around a cat is always to discourage any plant eating behavior in non approved areas. Even if you choose non-toxic plants you still don’t want a half eaten plant dragging down your home decor. Consider spraying plants with lemon juice. The spray will not harm the plant and will deter kitty, since cats have a very strong aversion to citrus. 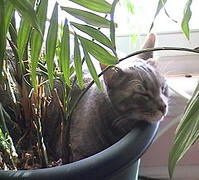 When a cat eats plants try to disrupt the behavior with a quick spray from a water bottle or a loud hand-clap. 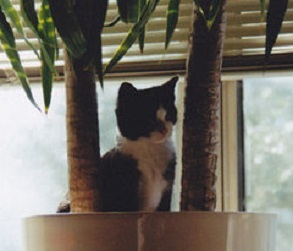 If you have a cat with a tendency to destroy plants, then consider placing the plants out of the cat’s reach. Do not put the plant in an area that will tempt the cat to climb on dangerous objects. Remember, cats like to climb anyway and you do not want to give them further reason. When choosing plants for your home there are plenty of types that you can purchase. You are certainly not limited to one or two plants. Here are some popular choices that are safe for plant eating cats. African Violets are very popular choices for indoor houseplants and they are said to be safe to grow around cats. However, keep in mind that Violets by nature are delicate. You will not want to try to successfully grow award winning violets since your cat will most likely try to chew on them at some point. Bamboo and Banana Plants as well as Boston Ferns are all safe choices if you’re looking for ornamental greenery as opposed to the flowering types of houseplants. In addition if you are looking for something quirky or a little different in presentation style you can try varieties of cactus. Cacti are safe ingestion wise, but as you would expect the prickling spikes on a cactus can injure you or your pet. Some pet owners consider this a built in training device. 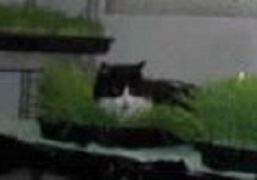 Cats learn quickly to stay away form these plants that bite back. Many plants have thorns for natural protection. There are many different types of plants that are safe around pets. If you have seen a certain plant that you like, the best thing to do is make note of the name of the plant and then consult your veterinarian. Although the plant may not be on a toxic or non-toxic list, a professional will be able to tell you whether or not it complies with houseplant safety guidelines. If you believe your cat ate plants that are toxic, even if it is not showing signs of poison, go ahead and call the veterinarian immediately to avoid serious illness.